Attorney Stephen M. Forlizzi is a DWI lawyer in Massachusetts and has successfully handled many drunk driving cases in Essex County. The Commonwealth of MA takes DWI/OUI very seriously. The consequences of a DWI or OUI conviction can include jail time, loss of license, and large fines. Some people think there is no way of fighting a charge and just resign themselves to accepting the consequences. That simply isn’t true. Regardless of the situation or evidence in any DWI or OUI case, you have rights and deserve protection. Stephen M. Forlizzi is criminal defense lawyer in MA and has the knowledge & experience of current Massachusetts DWI and OUI laws, and aggressiveness needed to make sure you get the most favorable outcome possible. It is important that you realize what you may be facing. In Massachusetts, the minimum penalties for a DWI and OUI are based on your blood alcohol content and also if you have any other convictions. Having a child in the car can lead to an increase in punishments. 1st offense—fine of $500 to $5,000. 1 year license suspension. Up to 30 months in jail. 2nd offense—fine of $600 to $10,000. 2 years license suspension. 30 days to 30 months in jail. 3rd offense—fine of $1,000 to $15,000. 8 years license suspension. 150 days to 5 years jail. For subsequent offenses, the penalties are even harsher. Some people may also be ordered to attend an alcohol treatment program and install an ignition interlock device on their vehicles. In addition, after a loss of license you may have to attend an RMV hearing to have it reinstated. It is important to have an attorney with you at this hearing. 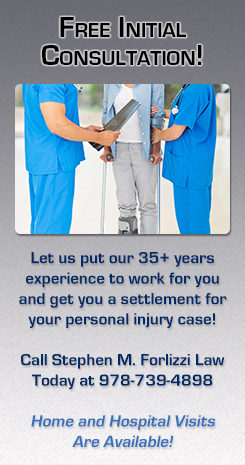 We will give you a free consultation so you can find out what you may be facing if the case goes to court. If we take on your case, the Law Office of Stephen M. Forlizzi will dedicate ourselves to doing what we can to get the minimum penalty, which may help you avoid jail time. Our negotiating skills can even potentially reduce the amount of time you have to go without a license. We will give your case the time and dedication needed, including time for us to investigate the allegations and circumstances so we can devise the best strategy. At the Law Office of Stephen M. Forlizzi, we know a DWI or OUI conviction can affect you and your family in a number of ways. Your job, reputation, and finances can all suffer. Our firm will be your advocate and explore all possible options to help you move forward from a DWI or OUI arrest in MA. For a Free Consultation with a Massachusetts DWI lawyer Call – 978-739-4898.